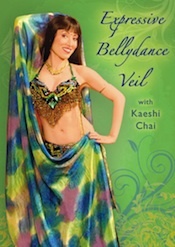 Kaeshi will demonstrate multiple moves that will enable you to become larger than life, to reach out and show your brilliance, as well as transforming the veil into different forms such as a rope, a whip, or a costume. Love this video. Great teacher as she explains the movements with great detail. Very fun veil moves as well.